Zlatan Ibrahimovic is renowned as one of the coolest customers in the Premier League so he will have felt right at home on his latest break from England. It is often said the Manchester United striker has ice running through his veins so the Swede would have barely noticed the freezing surroundings as he rode on the back of a snowmobile. 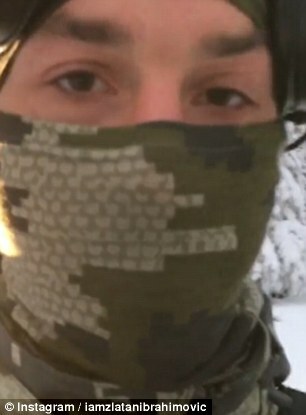 Along with the caption 'Find me', the 35-year-old filmed his trip through the Arctic conditions as he sat on the back of the vehicle, the extent of the cold revealed as Ibra shows off his camouflage snood to combat the plummeting temperatures.